Welcome to this freshly renovated cottage on beautiful Lake Muskoka. Located at the tip of a point, this property provides privacy, lake views out of all windows and cooling breezes. We are a short, easy 2 hour drive from Toronto, and in the center of Muskoka, close to tons of things to do. Located in the heart of Muskoka, we are only a 15 minute drive to both the towns of Port Carling and Bala for easy access to restaurants, ice cream shops, groceries as well as local festivals and attractions. The cottage is a freshly renovated 4 bedroom 2 bathroom, light and open concept retreat. BED 1 is on the main floor with an ensuite bathroom and has a king sized bed with a foam mattress. BED 2 is on the main floor with two single beds and foam mattresses. BED 4 is on the second floor and has two single beds with foam mattresses. The cottage is well suited for one family with (or without) kids to stay downstairs with the option of another family having a bit of privacy upstairs. The water is warm and clean. There is deep water to jump in off the dock, and a sandy, gentle access for wading in. There are no weeds in our lakefront, anywhere. There are activities for the whole family all year round. While summer is the most popular time to be in Muskoka, Septembers are some of the nicest days, and still quite hot but not as busy. October brings the changing colours of the leaves, Canadian Thanksgiving and the Bala Cranberry festival which is always a lot of fun and very popular & busy. Our family with two small kids uses this Muskoka cottage all summer long. When we're not able to use it we love to share the beauty of Lake Muskoka with others. It's all about the point of land. We've been to other cottages which are either too far from the water - who wants to hike down 100 steps to the water, or is in a deep forest (buggy), or is too remote. This property was the perfect cottage. It's very close to town, for groceries, markets, restaurants and of course ice cream. It gets great cell coverage, which we needed, is 30 gradual feet to the water, and gets a constant cross breeze, which means no bugs! We eat all our meals outside. The kids love fresh waffles with local maple syrup and fresh picked strawberries and blueberries from the local markets. The water is clean and deep, there are 2 docks with different exposures, so the sun seekers can roast while those who want some shade can read while watching the swimmers. It has something for everyone. The fireplace 5 ft from the lake! Go for a midnight swim and warm up in front of the fire. Dont waste your precious holiday doing dishes! Dishwasher liquid provided as well. Spices, Oils, Sugar, Paper Products, etc provided. We enjoyed our stay at the cabin. We are a family of 4, with two teenagers, and it was big enough we all had our own space, yet small enough that we spent a lot of time together. The docks and large rock by the lake had awesome views, and my husband and son enjoyed fishing from them. There are some cute little towns nearby for shopping and restaurants too. It was a great get-away. Lovely cottage with a beautiful view! Absolutely loved our time at the cottage. It is comfy and cozy on a chilly night and has a great view of the lake with afternoon sun on the dock! What a great place!. Stayed for a long weekend in mid September. Weather was perfect, lake was beautiful and the cottage was fantastic. The cottage had everything needed to have a worry free vacation. The owner, Carole was very helpful and accommodating. Bala is only a 5 or so minute drive from the cottage and has all the amenities you need, grocery store, butcher and LCBO. I would definitely recommend staying at this very picturesque location, and I am sure we will be booking again next year. Well I don't want to tell you about an incredible cottage on the best lot on Lake Muskoka with a view and sunsets to die for but I guess I have.! 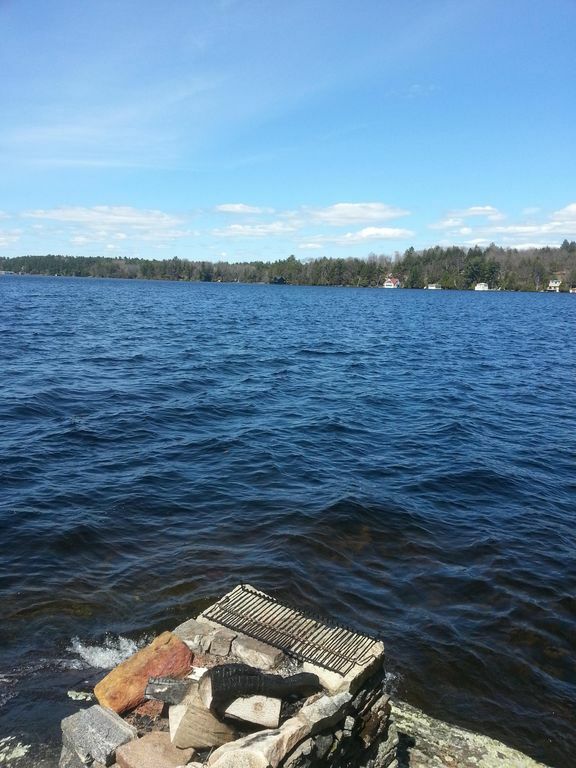 Incredible majestic White pines and gently sloping property to 2 docks and an amazing rock point set you in a cottage location you don't want the day to end except for the ridiculous sunsets you will have to frame and put on the wall. The cottage is clean and newly renovated with beautiful wood floors and a huge dining table inside and out. The deck is fantastic and you could sit there all day. Great fishing right there in front of the cottage. The pictures are good but much better in person. Can't wait to stay again. Four friends and I stayed at Carole's cottage for the May long weekend and despite having lost power due to a storm for a short period, had a fantastic stay. The cottage itself is very spacious, comfortable and has an awesome back deck. There are so many places to sleep none of us even had to share a bed! Having two bathrooms was ideal for all of us women as well. The large kitchen and BBQ made it easy to cook all weekend. The lake is right out back and there is a massive rock my friends and I spent an afternoon sunbathing and listening to music on. Carole is a lovely host, easy to get a hold and ensured we had everything we needed to enjoy our stay. Would definitely stay again and recommend to all. Great common spaces and large dining tables (interior and exterior). Comfortable furniture and clean linens. Our kids had a blast with the kayaks and the stocked play room. The view and the lake are amazing! Nice to have a marshmallow roast in the outside fire pit and enjoy the lake and Muskoka forest. On our wish list to return! Thank you for your kind words. We use our cottage as a family home for one month during the summer and keep it to the standards we expect for our family, and are happy when our guests can enjoy it too. Would be happy to have you back!